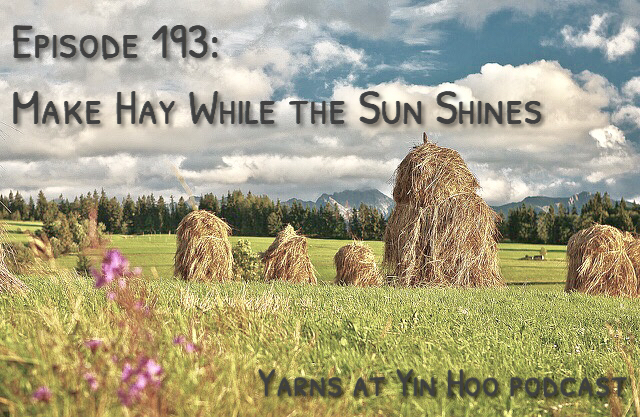 I’ve decided to seize the opportunity to record a short episode on a Tuesday afternoon so that I can fill you in on some of my recent projects. 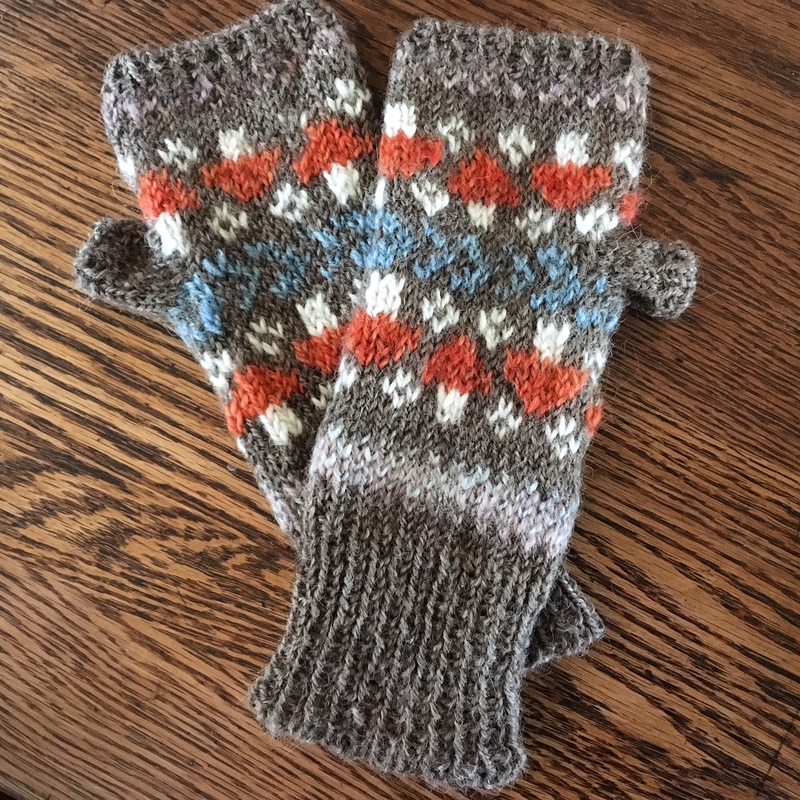 I love these mitts, improvised with SpillyJane’s design for Mushroom Kelliemuffs. 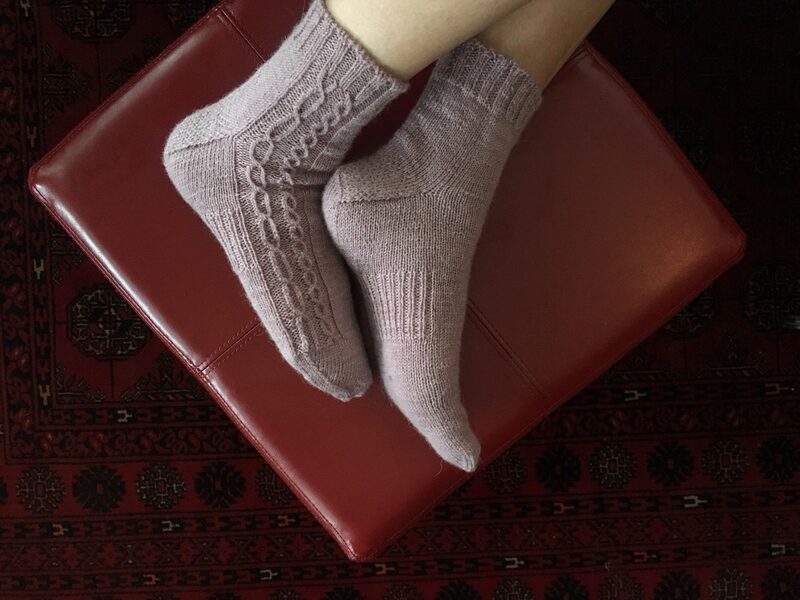 I used millspun yarn from Battenkill fiber mill as the main color, and bits of my handspun, hand-dyed yarn from Eloise’s beautiful Shetland fleece for the motifs. 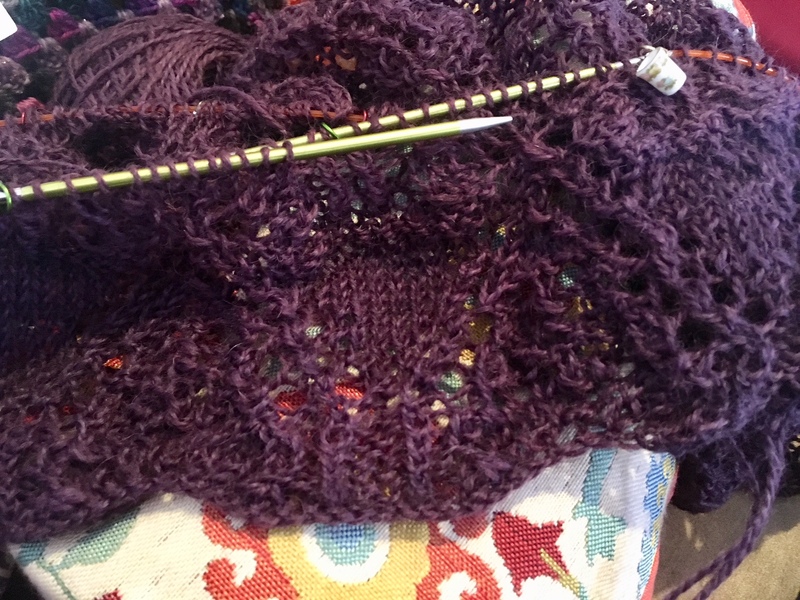 After many long thinks, debating whether or not I had enough yarn to knit Tegna, I took the plunge and have made it through the lace section feeling optimistic. 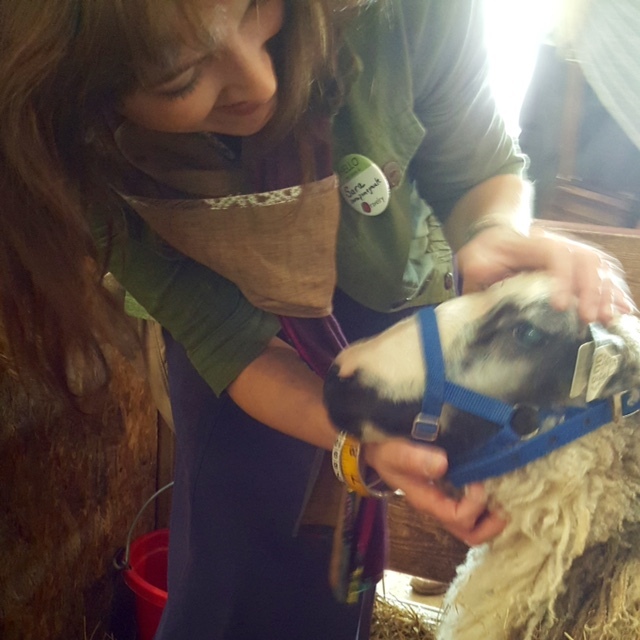 This beautiful wool/mohair blend, called Taconic Twist, was dyed with logwood by Tammy of Wing and a Prayer Farm. It feels sticky and stringy as it’s being knit, but the lace looks beautiful after it plumps a bit with steam blocking. I will have my work cut out for me rinsing the excess dye from the garment, but for now I’ll concentrate on knitting. Tegna is similar in fit and drape to the Deschain sweater, which I’m wearing a lot, so I think the finished garment will be a wardrobe favorite. I’m still having fun making water kefir — about three batches every two weeks. 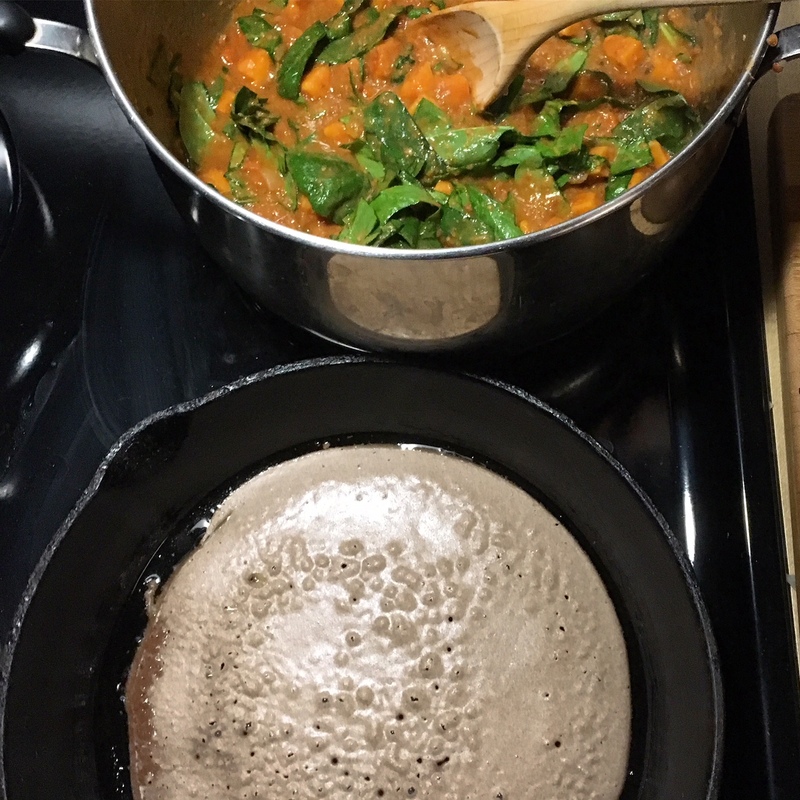 But I needed an additional challenge and decided to try two recipes from Sandor Katz’ Wild Fermentation: Sweet Potato & Groundnut (peanut) Stew and an Ethiopian staple bread called injera. The stew is delicious. I even incorporated some leftovers from the freezer: turkey gravy + water to substitute for some of the broth and a container of very concentrated tomato in place of the stewed tomatoes. I used very finely ground peanuts in place of peanut butter because for some reason there are peanuts in my freezer, too. The injera was another story. What you see above is my first attempt at a crepe or pancake. It was edible. The remaining attempts were not edible. Injera is supposed to be a soft, steamed, spongy-yet-strong staple in Ethiopian cuisine — used to scoop up other foods. My version was more of a stiff buckwheat pancake. I did enjoy the deep and somewhat sour flavor, but the texture needs a lot of work. Hopefully, I’ll get some tutoring from my sister Jessica this weekend.